Daniel Karrenberg shows an animation related to RIPE Atlas, RIPE's new active measurement project using USB-powered dongles scattered around the Internet. Video by jsq at RIPE 61 in Rome, Italy, 15 Nov 2010. His slides, the RIPE Atlas home page, and the conference will put up video of all the talks within about a day. PS: My talk is 11AM Rome time tomorrow, Tuesday 16 Nov. 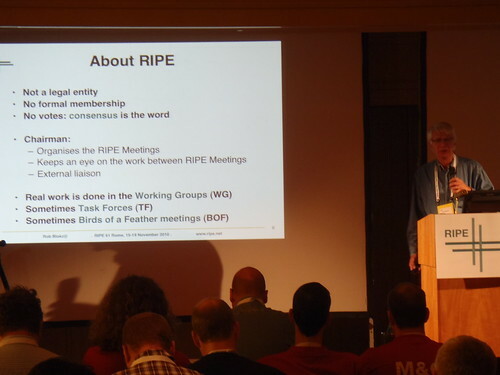 RIPE Chair Rob Blokzijl explains to newcomers that RIPE doesn't really exist. My talk is tomorrow, 11AM local time. 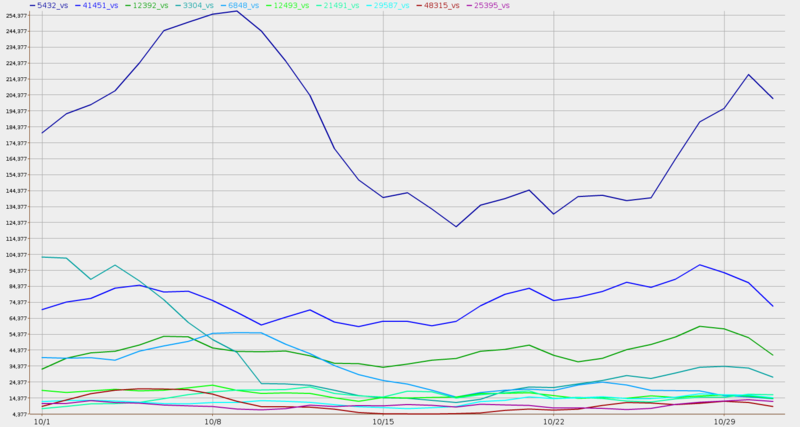 Should Uganda Telecom be counted as a Belgian ISP for outbound spam rankings? Which matters most: history, topology, business headquarters location, or some other criterion? These are some questions that come up in designing experiments in rolling out a reputation system for outbound spam. More on this in the RIPE Labs article (8 Nov 2010), Internet Reputation Experiments for Better Security. Such experiments can draw on fifty years of social science research and literature, first crystalized as Social Comparison Theory by Leon Festinger in 1954, that indicate that making personal reputation transparent changes personal behavior. More recent research indicates that the same applies to organizations. Using anti-spam blocklist data, it is possible to make E-Mail Service Provider (ESP) behavior (banks, stores, universities, etc., not just ISPs) in preventing or stopping outbound spam transparent, and this paper is about experiments to see how the resulting reputation actually changes ESP behavior. In RIPE Labs, here's a paper on Internet Cloud Layers for Economic Incentives for Internet Security by the IIAR Project (I'm the lead author). Anti-spam blocklists and law enforcement are some Internet organizational layers attempting to deal with the plague of spam, so far reaching a standoff where most users don't see most spam, yet service providers spend large amounts of computing and people resources blocking it. The root of the ecrime problem is not technology: it is money.